"I consider my best marathon the Twin Cities Marathon in 2009. ...I was qualified in the 10k for the US Olympic Track Trials, and given that I was living in Oregon, everyday that got closer to the Trials, I got more and more pumped up. 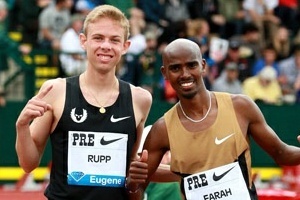 Eugene is Track Town USA, and everyone knew it was coming. The excitement was building. Three weeks before I would have toed the line at the trials, I was limping, running through large amounts of pain in the top of my foot and lower tibia. Two and a half weeks before the gun went off, I was in a boot, diagnosed three stress fractures. I was distraught, and everywhere I looked, I couldn’t forget about the fact that the trials were approaching, and I would no longer be a part of it. Emotionally, it was just too hard to stay in town, and so I packed up my things, with my rottweiler (Maximus) in the front seat, and left my coach, left some close training partners and friends, and drove to Boulder." "I moved in with Jorge Torres and took to cross training like hard, biking up canyons in a boot, and doing everything I could to come back. I was in that boot for 12 weeks, and when I was finally able to run on land, the times were not pretty. I started training with Jorge Torres under Coach Steve Jones, and little by little, put one foot in front of the other, and started to come back. So many people told me that my career was done, and that I should just transition into other things, that I started to feel that no one believed in me except a small handful of close friends and former/current coaches. To rebound from that to not just place, but to WIN Twin Cities, set a personal best time, and to beat an international field boasting personal best times 3, 4, 5 minutes faster than me." - Jason Hartman talking about what race he considers the best marathon of his career so far. His 2:11:06 PR comes from Chicago 2010. Alan Webb = a runner of sporadic brilliance? Are you joking Mr. Johnson? Sunday: 5th Avenue Mile Start lists here. Jenny Simpson and Nick Symmonds are both racing with a ton of other US stars. Message board prediction thread here. 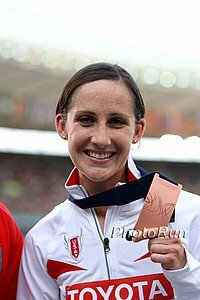 *Big Moves For Shannon Rowbury Who's Boyfriend Proposed To Her In London This Summer And Is Moving To Portland To Be Coached By Alberto Salazar She's racing the 5th Avenue Mile today and then going to search for wedding dresses with Kleinfeld Bridal (of Say Yes to the Dress fame). 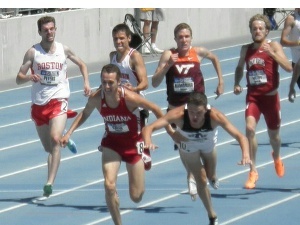 Sunday: Downtown CVS 5k USA Champs Tegenkamp and Solinsky both running. Molly Huddle and Infeld. Message board prediction thread. Kenya’s Leonard Komon (The Second Fastest Ever Over 10 Miles) Is Favorite To Win His 3rd Straight Dam tot Damloop Title This Sunday He faces three runners who who finished in the top eight in the Moscow 10k in Abera Kuma, Kenneth Kipkemboi and Nguse Amlosom as well as sub-60 minute half runner Peter Kirui. 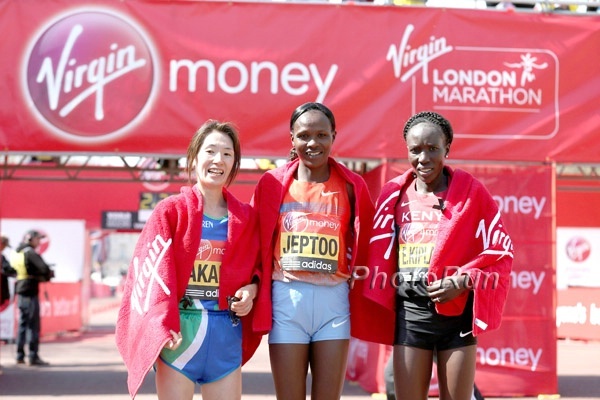 2-time World 5000 silver medallist Sylvia Kibet defends her title with her younger sister Valentine (71 half0, Filomena Chepchirchir (2:25 marathon) and Joyce Chepkirui (67 half) in the field. Russia's 2:10 Man Aleksey Sokolov The Favorite At The Siberian International Marathon On Sunday Russia's 2:31 woman Yevgeniya Danilova will take on Ethiopia’s Meseret Mengistu (2:29) who is coming off a marathon less than 2 weeks ago. Friday: World Champs 10,000 Bronze Medalist Paul Tanui Wins Japan Corporate Champs 10k In 27:26 Doricah Obare won the women's race in 32:02. LRC After Just One Year On The Job, Terrence Mahon Is Out As UK National Distance Coach He's returning to the US and the question naturally becomes, "Why did he leave and what's next for Mahon?" Mahon has emailed and said Uceny and Willard will both soon doing altitude training in Mammoth with support from the Mammoth TC. Glasgow Herald Writer On Farah/Bolt 600 Meter Clash: "It worries me that this is what track & field evidently feels it has to resort to in order to grab attention of the public." This race probably won't happen, but if it did would non-track fans even care? We'd like to see it for the same reason we'd like to see Bolt race David Rudisha over 400. Usain Bolt: I stay away from dating 'English ladies' for fear of appearing in the British press Bolt said, "Over the years I've got into trouble three times after liking English ladies. All of sudden I'm the paper, my whole story is in the paper, so I've taken note of you English ladies, so I'm very careful. I stay away from English ladies." Video: Usain Bolt Reconsidering Plans To Retire After 2016 Olympics Because Of His Fans' Reaction To The News "I am definitely reconsidering [retiring after 2016]. I think my fans especially have really voiced their concern about me retiring." Usain Bolt Says He Would Probably Only Run The 200m If He Decides To Compete At The 2014 Commonwealth Games Some random side notes: he says he now avoids dating "English ladies" because he always ends up in the paper, he doesn't like politics, and he wouldn't want to be a coach because he knows athletes can make you crazy. Usain Bolt, A Big-Time Manchester United Fan, Does Puma Ad With Rival Team Manchester City's Star Player Sergio Aguero Afterwards, Aguero said, "[Bolt] showed some skills though. He is not good enough to play for City, but I think he would have a good chance of getting into the United team." Pat Rizzo: Why I Ran RnR Philly And How I Will Deal With CGI In The Future Rizzo already had planned to use the race as his final prep before Twin Cities. However, in the future, he won't be participating as he's irate that the company that he's worked for as an UNPAID volunteer for years is knifing the sport in the back. *MB: Labor lawyers: How is it legal for Competitor Group to use volunteers without paying minimum wage at races? Shelly-Ann Fraser-Pryce Said Many Athletes Believed She Was On Drugs This Season "Some thought I was on drugs for me to have done what I did. ... How I can have such a long season and still go at the end of the season and run so fast?" Russian Aathletics Federaion Handed Down Two-Year Bans To Long Jumper Tatiana Kotova And Hammer Thrower Kirill Ikonnikov The 36-year-old Kotova was the 2000 and 2004 Olympic LJ third placer and is getting banned for a test of her 2005 WChamps sample. Column: 3 Years Ago, Ryan Gregon And Andrew Wheating Seemed To Be The Future Of Middle Distance - What Happened? *MB: Webb = a runner of sporadic brilliance? Are you joking Mr. Len Johnson? Ezekiel Kemboi To Retire After 2016 Games We guess this means he's not moving up to the marathon? Speaking Of Elites, Do Elites Matter? Toni Reavis: The Slowing Down And Dumbing Down Of American Running Culture Nowadays, even Boston qualifiers have no connection to the elites. 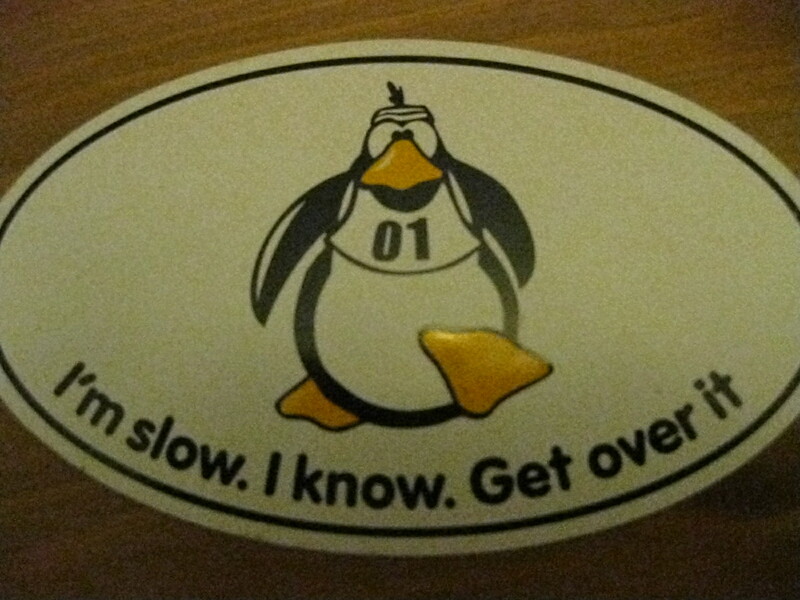 Agent Brendan Reilley: "I think we've had too many years of the John Bingham (Waddle On, Penguins) philosophy. John is a nice guy, a very entertaining and eloquent speaker, but there seems to be little in the sport these days to carry the runners that John has gotten off the couch to the next level of aiming to run faster and treat our events like RACES." *Bingham Responds In Comments Section: "I guarantee that the first 'elite' to show even a LITTLE interest in the rest of the pack will become a hero overnight." MB: How to justify competitive running at the amateur/hobbyjogger level? More Toni Reavis: Races Need To Stop Hiring "Fast People With No Entertainment Value"
The "Big 5" Think So: PRRO Offering New $24,000 "Bump Up" Bonus For Next Season A runner who wins Peachtree plus one of the following four races (while being top 3 in the other 3) - World's Best, Bloomsday, Boilermaker, Cherry Blossom - will win a $24,000 bonus. LRC LRCers In The Real World #1: Rojo Calls Into America's Top Sports Radio Station, Admits To Drinking, Host Says On Rojo Analysis, "On a stupid scale of 1 to a 100, that's at least a 99." The intersection of the running world and the real world fascinates us. With that in mind, we present to you a new ground-breaking investigative series on LetsRun.com: LRCers in the Real World. We lead off with LRC founder Robert Johnson (Rojo) calling into America's Top Sports Radio Station and trying to break down the Dallas Cowboys Week 1 win over the Giants. It gets interesting real quick. Did Rojo prove on the air what some of you have long suspected - that he's an idiot? Or would his genius be secretly revealed? *Triathlete punches woman en route to win!!! Marathon News: Where Will 2016 US Marathon Trials Be? Good Read: Daily Relay Q&A With Jason Hartman Hartman shares that he thinks his best marathon was when he won the 2009 Twin Cities not long after coming off 12 weeks in a boot for a stress fracture and gives some interesting insight into his relationship with Dathan Ritzenhein who was his high school teammate. World Steeplechase Champion Micah Chemos Wants To Move To The Marathon After Rio 2016 She'll be running her half-marathon debut at this December's Baringo Half Marathon in Kenya. 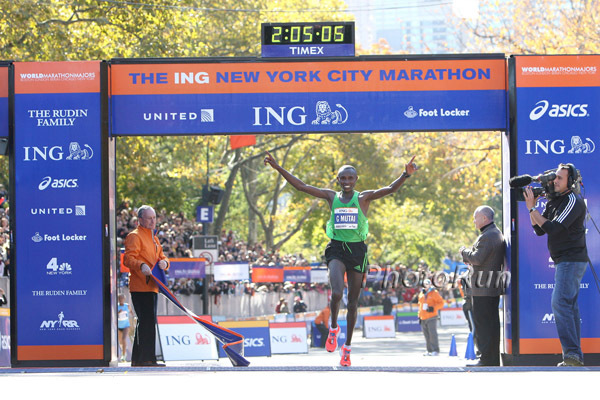 Coming November 6, 2013: LRC Geoffrey Mutai, The Fastest Marathoner In History, Will Battle World And Olympic Champ Stephen Kiprotich And Ryan And Meb At 2013 ING New York City The NYRR released the whole field and we give you stats on everyone and break it down for you. LRC The Top Two Women's Marathoners In The World, Priscah Jeptoo And Edna Kiplagat, To Clash At 2013 ING New York City Marathon - Kara Goucher Is Out With Injury The women's race in New York should be stellar as the London champ will clash with the former NY champ and current two-time World Champ. Plus, will Croatia's Lisa Stublic be the top American? ... Yes, we wrote that on purpose. RR: Kara Goucher's Blog Post On Pulling Out Of NYC: "Letting Go Of A Dream" "I will continue my 100+ miles a week running on my AlterG treadmill and keep thinking about one special moment at the 2008 Olympic games when Constantina Dita of Romania became the Olympic Marathon Champion at the age of 38. You see, I will be 38 in Rio 2016. And I still believe." NYRR Profile Piece On Japan "Citizen Runner" Yuki Kawauchi, Who Is Racing NYC This Year We guess NYRR are trying to reach out to non-runners by comparing Kawauchi to a one-man football team since he's one of few Japanese runners to not run for a corporate team. Sunday: Elite Field For Sunday's CVS Caremark Downtown 5K - Cragg, Tegenkamp, Solinsky, Huddle And Hastings To Headline Two sub-13:00 guys. Not bad. MB: 2013 CVS 5K Discussion - Who you've got? Bumby, Teg, Solinsky, Braun or Chelanga? Huddle or Infeld? USA Today's Amazing Races To Run Before You Die Mesa Falls Marathon in Ashton, Idaho, the Emerald Run, the Emerald Nuts Midnight Run and Honolulu Marathon are the only US races. Profile Of Ed Whitlock - The 82-Year-Old Reluctant Hero Of The Marathon, Who Is Racing 2013 Scotiabank Toronto Waterfront Marathon Next Month Also racing is 64-year-old Yoshihisa Hosaka, who will go for 2:42:44 record. 113 Days After Giving Birth, 2008 And 2012 Olympic Javelin Champ Barbora Spotakova Is Competing Well We're more impressed that she won the Olympics in August and had a baby in May. 5 Days Ago On Our World-Famous Message Boards: Shannon Rowbury to OREGON PROJECT! Want To Be A World Champion? The Telegraph Shares What They Believe Are The "9 Key Elements" Of Mo Farah's Running Form That Make Him So Fast Results came from biomechanics experts from the University of Oxford and look at everything from foot strike to arm position. Video: How To Run Like Mo Farah Dr. Jessica Leitch cautions, though, that "There is no right way to run, neither is there a one size fits all solution for optimal running gait. What works for Mo might not work for everyone and may even lead to injury." David Rudisha's Coach Colm O'Connell Talks About Doping: "Of course they're always the, I use the word 'mediocre,' ones who use to try and get the extra edge." No, we're pretty sure even many of the top guys are looking for "an edge." Quadruple The Fun: UK's Triathlon World Champ Non Stanford Thinking About Doubling Triathlon-10,000 At 2014 Commonwealth Games She ran a 32:39 10k in March, which is under the Commonwealth Games "A" standard, but the qualifying window didn't open until April. Future Pro? DyeStat Article On High School Junior Alana Hadley, Who Is Passing On Her XC Season To Focus On Making The Olympic Trials Marathon For 2016 She's running 100-110 miles/week and will be going for the 2:43 "B" standard at the Indianapolis Monumental Marathon on Nov. 2. The youngest ever Marathon OT competitor in 2012 was 22. Man Who Was Evicted For 1964 Tokyo Olympics To Be Evicted Again For 2020 OlympicsHe is being evicted, as his apartment complex is being demolished for the Olympic stadium. The same thing happened to him back in 1964. 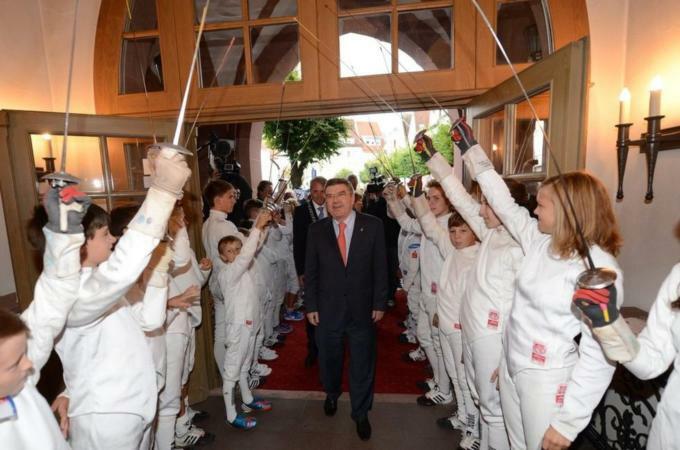 Hard to blame him when he says, "I have a kind of grudge against the Olympics." How Many Times Have You Heard The Old "I Couldn't Drive As Far As You Run"? Well, If Someone Said That To You In Moscow, They Might Be Right Data shows that on a Friday night, sub-3 hour marathoners could outrun traffic in Moscow, as drivers would need more than 3 hours to cover the 26.2 mile route. 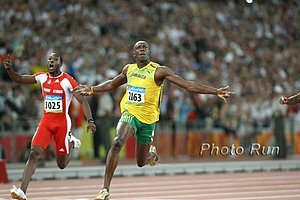 The Bahamas To Spend $3.5 Million To Host The IAAF World Relays In 2014 And 2015 If you haven't heard previously, the relay races will include the 4 x 100m, 4 x 200m, 4 x 400m, 4 x 800m and 4 x 1,500m ... no DMR. Recommended Read: WSJ Article On How Today's Generation Of "Runners" Are Slower, Don't Run Hard And Are "Turning Some Races Into Parades" Article includes a quote from LRC's Rojo: "If you're going to get just as much praise for doing a four-hour marathon as a three-hour, why bother killing yourself training? It's hard to do well in a marathon if your idea of a long session is watching season four of 'The Wire.'" 7 Athletes Failed Drug Tests At Moscow World Champs: Guatemala's Jeremías Saloj Was 33rd In The Marathon; Ukraine's Roman Avramenko Was 5th In The Jav The other athletes were Massoud Azizi (Afghanistan, men's 100m), Elyzaveta Bryzgina (Ukraine, women's 200m), Ayman Kozhakhmetova (Kazakhstan, women's 20km walk), Ebrahim Rahimian (Iran, men's 20km walk) and Yelena Ryabova (Turkmenistan, women's 200m). Ben Johnson Is The Face Of A New Anti-Doping Campaign But Some Of His Quotes Make It Seem Like He Thinks It's A Dopers Support Group J ohnson says he's "...trying to help future generations and future athletes, athletes of my calibre, who have tested positive, been in the same boat as me, trying to help them and say you're not alone." Is he going to pat them on the back and say "It's ok"? It's not ok.
Telegraph's List Of The 10 Biggest Sports Cheats Ever This list comes out to mark the release of 9.79*, a documentary about the infamous 100 final at the 1988 Seoul Olympics, or the "dirtiest race in history". LRC WTW: A Special Great North Run, Kenenisa Bekele Is Back, US 1,500 Women Rule, And Has Haile Gebrselassie Learned The Error Of His Ways? We span the globe starting with some tremendous road racing between Kenenisa Bekele, Mo Farah and Haile Gebrselassie in the UK. We look at the US 1,500m women, Bernie Montoya, and throw in some drug news as well. Former Athletics South Africa Board Member Had Her Lifetime Ban Lifted For Her Role In Caster Semenya's Original Gender Tests Before 2009 Worlds sports.espn.go.com Laraine Lane was banned for lying for lying about the tests done on Semenya before Berlin 2009, but Lane argued she was unfairly punished. This S#!+ Is Still Going On? Leyton Orient Soccer Team Refused Judicial Review In Bid To Ground Share Olympic Stadium With West Ham If the horse is dead, get off. Your Votes Are In LRC Oklahoma State A Heavy #1 On Men's Side, Duke And Providence Up Top On Women's The LRC faithful have weighed in via the LRC Super Fan XC Polls and Dave Smith's Oklahoma State Cowboys are heavy favorites for the NCAA crown with little separating NAU and Colorado in second and third. On the women's side, Duke is #1, with Providence actually getting more first place votes, with Oregon at #3. Regional and national poll results. It's Official: Shannon Rowbury To Be Coached By Alberto Salazar Her previous coach John Cook is retiring, so Rowbury will move to coach Salazar. LRCers might have already known this. Mike Sandrock Shares His Observations After A Run Through Flood-Devastated Boulder Where Many Have Lost Homes And Popular Running Trails Have Been Washed Away Sandrock did his run with 1989/1990 Foot Locker Champ and former NCAA champion Melody Fairchild and ran into Mark Wetmore along the way, who had to walk to town and back in order to coach. Good Read: Melody Fairchild Blogs About Her Emotional Run Through Boulder Trails To See If The Childhood Home She Grew Up In Was Still Standing In The Wake Of The Floods "Today, as I ran against the force of the water, I felt so small, and my long run to see the results of Mother Nature's power made me bow down to her in reverence, and with complete surrender. ... I went as far as I could safely go and then started climbing." NYC All Over Again: Boulder Marathon (Scheduled For This Sunday) Postponed Due To Extreme Flooding The flooding has caused 6 deaths and one thousand remain unaccounted for. Jason Hartman Tweets About Training In Boulder Flooding www.nyrr.org "Crazy doing a tempo and having national guard helicopters flying over you while doing it. #ingnycm"
*MB: Harvard Sweeps Yale 1-2-3-4-5 in 100th meeting between two, H Women dominate as well All time, it's now H 60, Y 40. *100th Harvard-Yale XC Clash Is This Weekend Harvard leads 59 to 40.